Like most visitors to the Asclepion at Epidaurus I spent most of the time in the museum or walking about the magnificent amphitheater. Back in the 1980s, when I was there, the remains of the Tholos consisted of the underground labyrinth. I could not make much of that at the time, but after seeing the remains of the Tholos at Delphi and the Tholos at Athens, my interest was piqued. architect Polykleitos of Argos, 360 - 330 BC. Near the temple of Asclepios are the ruins of a circular edifice known as the Tholos. It had a circular sekos, a wing and an inner colonnade. A ramp led to its entrance, which - as was customary with temples - was situated on the east side. Twenty-six columns comprised the exterior Doric colonnade, supporting a Doric entablature adorned with relief metopes with rosettes. 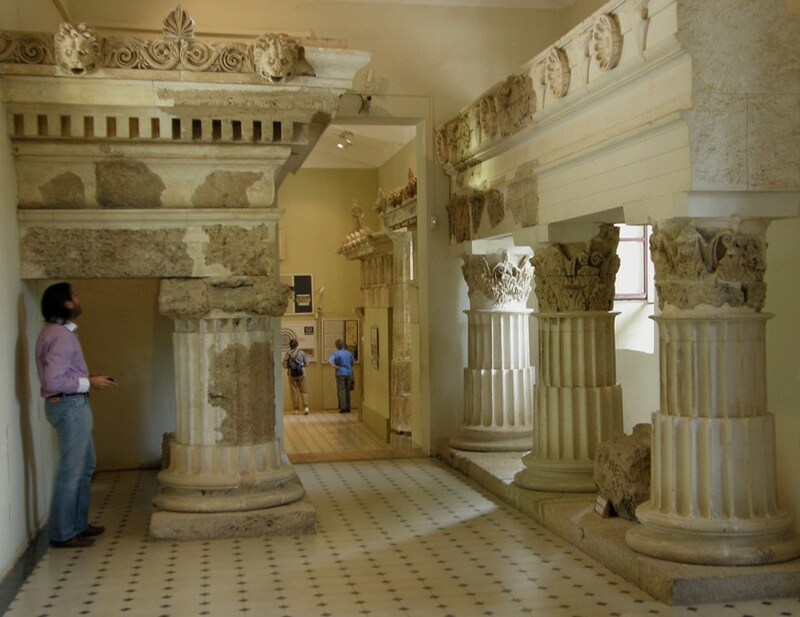 The inner colonnade consisted of 14 columns of the Corinthian order. The wall of the sekos was between the two colonnades. This was made of white marble and had a window to let the light in. A large number of relief decorative elements – egg-and-dart mouldings - adorned the door of the sekos. The floor was paved with black and white limestone slabs». A wide circle of black stone was in the centre. A circular white stone was at the centre of the circle. The stone was not secured so that it could easily be removed by any person wishing to go down to the basement with the three concentric corridors. The person who carried out the excavation thought at first that it served as a space for storing valuable objects. The inscription which gives an account of the cost of the temple refers to the Tholos as "THYMELA" and for that reason it has been supported that the Tholos was used as a refectory where the priests had their meals. A recent theory as to the purpose the Tholos served is that Asclepios, deprived of his heroic nature, was worshipped there. This was so because Asclepios was a celestial god, an Olympian god, who was worshipped at the temple beyond the Tholos. But he was also a hero who derived his strength from the earth and ascended from the tomb just like a snake comes out of the earth. 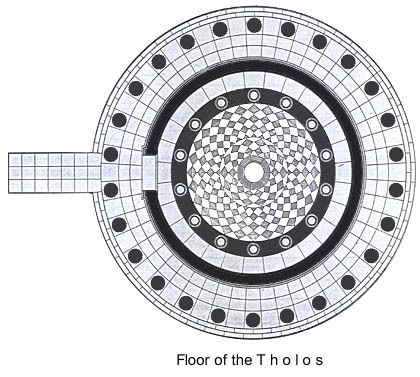 The Tholos is the symbolic tomb of the hero who lives inside the earth. 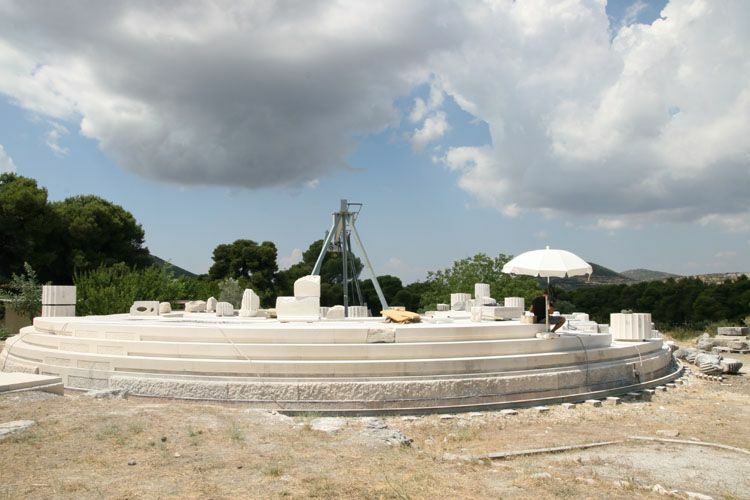 The excavation of the temple of Asclepios at Pergamus, the most famous in Asia Minor, where a centrally-planned building was discovered, has made a significant contribution towards solving the problem. Some think the building demonstrated the two astronomical theories concerning the Sun: the geocentric theory of the sun's apparent course and the heliocentric theory with the sun at the center. The apparent course appeared on the exterior of the Monument for all visitors to see. The Heliocentric system inside the monument for the initiated. 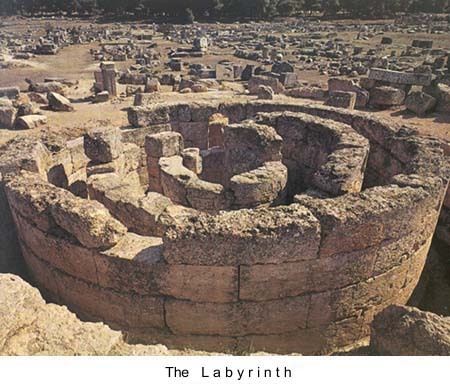 The labyrinth is all that remains of the tholos today. It was positioned directly below the inner circle of columns. 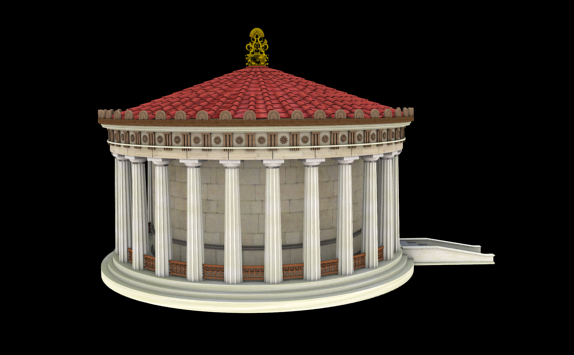 Another theory has the tholos as an abaton. Patients were to sleep on the floor of the building and a priest would descend into the labyrinth and offer prayers directly below each of the patients. The god would descend into the dream of each patient and provide a remedy or directly cure the patient. There is also some mention of the patients sharing the tholos with a number of snakes. No authority has explained how a person might fall asleep with a room full of snakes.